Courtesy of Fathom Realty NC, LLC, Nicholas Giuggio. THE GRAND DAME OF 12 OAKS! William Poole’s ‘Brewton House’…inspired by the Charleston landmark is brought to life in magnificent form. 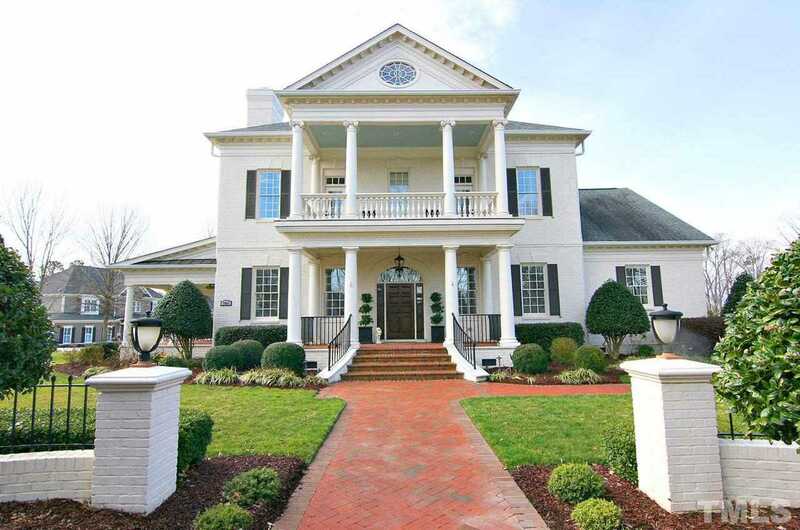 Both classic + functional this Georgian treasure is a one of a kind truly custom built home. Prominent setting across from 14th tee on main round about in resort style neighborhood with amenities galore. For those who believe a connection to the past can ignite the future…WELCOME HOME. Directions: From West Cary/Raleigh take 540 to Holly Springs. Exit 54B (Hwy 55 towards HS). Follow 55 to (R) New Hill Rd @ Target. Continue on New Hill to (R) Green Oaks Pkwy. Home at traffic circle on left.